Adelaide's colonists found the city heat too overbearing in summer, so wealthy citizens soon flocked to the seaside and the Adelaide Hills. Here at Glenelg, they built grand mansions as a display of their wealth and as holiday houses by the sea. Soon the natural sand dunes of the Esplanade was built upon. A road made along the seafront south of the jetty was called Albert Parade named after Queen Victoria's new husband. Later this street was known as Seawall, and is reflected in some of the names of the buildings you will come across on the walk. The magnificent Victoria home Stormont with superb examples of early foundry made iron lace work. Image by Kat May. 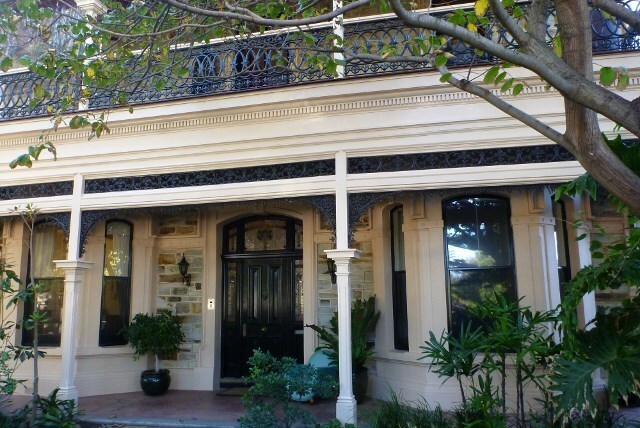 Many of the huge Victorian-era mansions still stand today and some are State heritage-listed. By exploring the area on foot you can see them for yourself. The walk is a pleasant and easy one, which covers the mansions that overlook the sea and also many that are hidden back in some side streets south of Jetty Road. To explore the area, you will need the map of house locations. 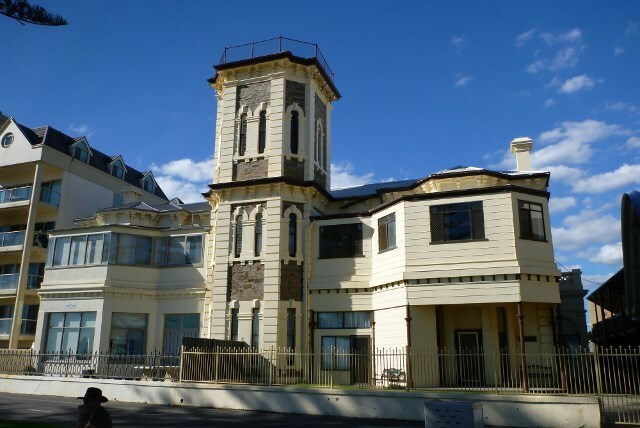 There is a good little booklet produced by the City of Holdfast Bay which lists the houses in the order you come across them on the walk with a little information about each of these fine stately homes and buildings. The old home of Seafield Tower. Both residences could access the tower but had seperate entrances to their home. Image by Kat May. The walk starts on South Esplanade at the magnificent Seafield Tower. 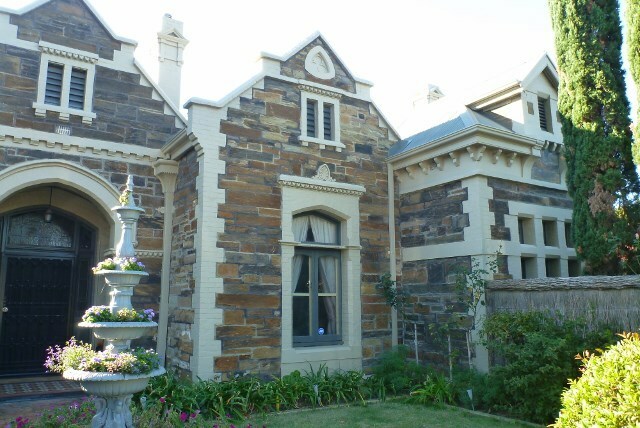 Best mates and local gentry Thomas Elder and Henry Ayres, who lived at Ayers House on North Terrace had this duplex mansion built for their families to enjoy over summer. This house has had modern cladding put on it and ugly modern windows in parts but the bones of the old stone home is still there. It really needs some renovations. And so it goes as you stroll along looking at how some spent their summers up to 140 years ago. The booklet tells some fascinating snippets of history about the houses and their owners. Learn which mansion was lost in a card game to his neighbour in the same street. Back then, a gentleman kept his word and handed over the grand house for good. Discover which home has a grand ballroom and you can see it from the side as you peer through the fence. This two story home has a lovely garden still there on the large block beside the house. Image by Kat May. Other buildings are also included in the walk, such as blocks of flats showing the new modern Art Deco design of the 1930s and 1940s. How lovely that these superb examples of Adelaide's architecture are still here, some sitting incongruously beside a modern tower of luxury apartments. One of the buildings was turned into a school and the front lawn of the house and beach was used by the children during playtime. Some of the old buildings can be hard to spot as the olden day photos are shown in the booklet and the buildings have changed over the years. One is now a backpackers lodge. You have to walk the route, not drive, as the walk takes you where there are only footpaths and South Esplanade is a no-through road. But by walking, you slow down and really take in what you are discovering along the way. After the Esplanade, the walk changes direction and you head into the side streets. Smaller cottages built around 1880 in a row. These are listed on the brochure. Image by Kat May. An interesting part to see here is the old service lanes. One service road with original old stone walls is still here, now called St Johns Row. This lane backs onto the mansions on the Esplanade. The service roads were built for the dustman, effluent removal and deliveries. As the land area of the mansions were subdivided, you can see more modern homes built where large gardens once were. Although some present day owners have wonderful gardens you can view through the fence. You can also see an old stable or coach house to house the horses and carriage that would have brought the family the long, tedious journey on a dusty road from the city. Another interesting feature is the folly of the Victorian era to have some sort of tower or walkway so you could have views of the sea. In the early times of the colony, this was important as everyone was anxiously awaiting the next ship from England to bring letters from home and supplies such as furniture, pianos and the latest Fleet Street books. On the walk, you will come across the grand "widows walk" across the roof of one of the homes. Ships would pass by Glenelg to dock at Port Adelaide. The English influence is seen here in this home built around 1920 with its tudor style and roof ornaments. 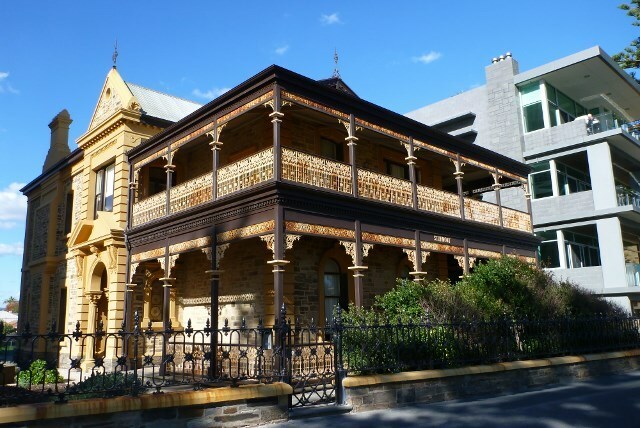 Yours to discover in historic Glenelg. This is a fascinating walk and easy to do by yourself. It is a shame many interstate visitors make the tram trip to Glenelg, then wander Jetty Road shops and the beach or jetty and then leave. 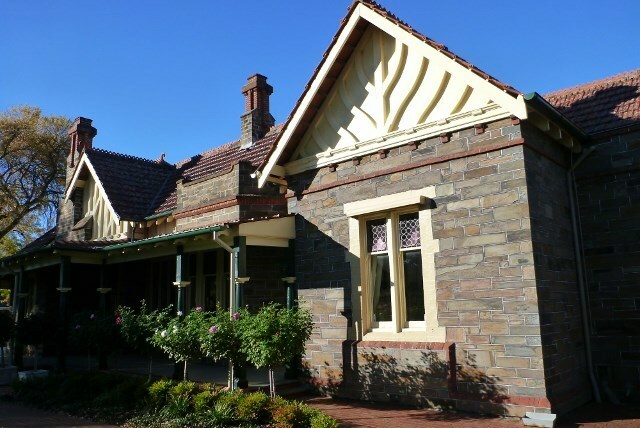 There is so much history and beautiful things to see in Glenelg and this walk is a marvellous way to spend an hour or two looking at our heritage. Please remember these houses are still private homes, so be respectful and only view them from the footpath and keep your voices quiet. If you want to photograph the houses, the afternoon would be better as the sun will be behind you for most of them. The brochure says the walk takes 45 minutes but I took longer, stopping to take it all in and take photos. If you are short of time and want a quick walk, see the houses along South Esplanade and head back along the beach. If you would like to break up the walk with a rest break, there is a cafe on the end of the South Esplanade near where the walk turns left or on The Broadway which is one more street south. Alternatively, wait until the walk brings you down Mosely Street and back to Jetty Road. Bay Discovery Centre at the Town Hall in Mosely Square, Glenelg (at the last tram stop). Holdfast Bay Discovery Centre, 14 Jetty Road Brighton. *Visitor Centre Adelaide City, off Rundle Mall. Why? Discover our beatiful heritage with some lovely old stone buildings. Where: Walk starts on South Esplanade, Glenelg. Cost: Basically free, but gold coin donation of you pick up the map booklet. Fascinating story. I have walked past some of these homes, but it will be more interesting with the brochure. What a great idea for an afternoon stroll. Map is not available at Visitors Information Centre in James Place. Tried to pick one up while in the city today and they had no knowledge of it.